1. BE A PERV – Get frisked. Several times. 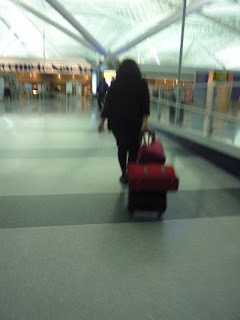 That’s right, just keep going back and forth through airport security. When TSA looks at you funny during the pat down, grin mischievously and say, “oh yeah, that feels good.” Make sure to mean it when you say it. If you don’t get frisked, just smile and tell them you think they missed a spot. Use your eyes to show them the spot. You know the one. See how many times you can do it and actually get away with it. 2. FLIRT – Walk around, linger at a gate, and when you find that perfect someone stare intensely. Don’t blink. When they finally catch you staring, walk on over and use the flight delay / cancellation / on time boarding as an ice breaker to get to know the one you’ve been scaring. Go for it! Ask that person out on a date. You can go to the food court for coffee. If you still like each other after coffee, grab a bite for dinner. Take it a step further and try speed dating. 4. CALL YOUR MOTHER – Or better yet, call another mother, like my mother. Make sure you’re wearing the blue tooth when telling the mother of your choice what you’re doing, and not doing, and make sure to give details, lots and lots of details. Take it up a notch and explain to her, very loudly, exactly what the passenger sitting next to you is doing. Continue the play by play for as long as possible. Heather, you are hilarious. Thanks for brightening my day.